While most associate dog meat consumption with countries such as China and Vietnam, few know about the thriving trade in dogs that takes place in Cambodia. Now, thanks to an agreement with an anti-landmine organization that relies on dogs to detect mines and the efforts of a UF Shelter Medicine alum, the Cambodian dog meat trade may be coming to an end. The Kingdom of Cambodia is home to a massive dog meat trade that spans just about every province and city. 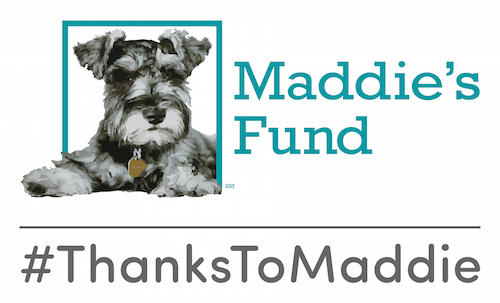 Home to about 16 million people, it is estimated that up to 2-3 million dogs are stolen, traded, and slaughtered for human consumption every year. The trade causes considerable animal suffering, as well as poses a significant human health risk due to the threat of rabies transmission and other zoonotic diseases. Problems of this magnitude require innovative strategies and the cooperation of multiple stakeholders. 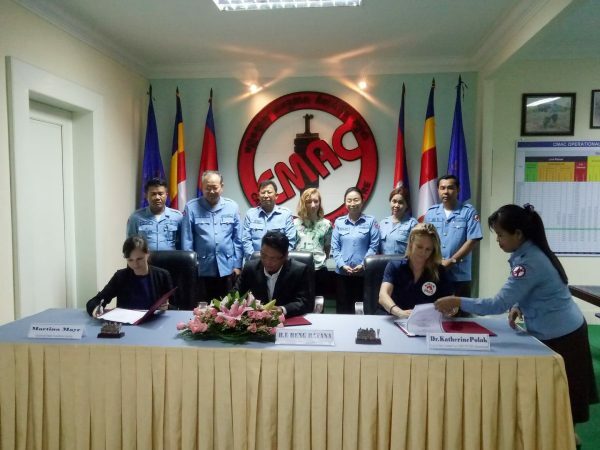 Just last week in the capital city of Phnom Penh, Dr. Katherine Polak, former UF Maddie’s Resident and current Head of Stray Animal Care – Southeast Asia for FOUR PAWS International, signed an agreement with the Cambodian Mining Agency Centre (CMAC) and local charity Animal Rescue Cambodia. This landmark agreement is the first of its kind in Cambodia, effectively forming a tripartite agreement focused on tackling the animal welfare and public health risks associated with dog meat consumption. While the dog meat trade is not illegal in Cambodia, public opposition to it is growing, particularly among pet owners. 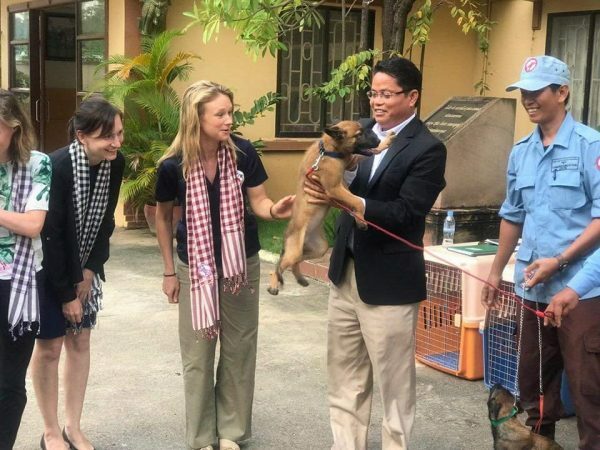 CMAC is the leading governmental organization in Cambodia advocating for canine welfare through their use of de-mining dogs. Left over from the Vietnam war, it is estimated that there are between 4 to 6 million pieces of unexploded ordnance (UXO) still in existence, posing a huge public health risk.CMAC employees teams of Belgian Malinois dogs to aid in sniffing out these unexploded landmines and cluster bombs. This means dogs are critical to supporting the socioeconomic development of Cambodia. 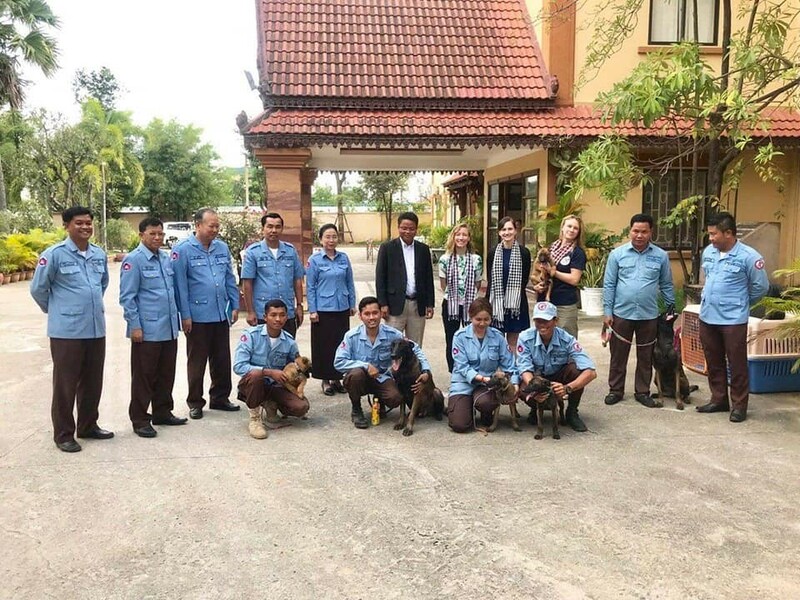 “Through this unique partnership, we hope to highlight the important role dogs play in Cambodia, and effectively tackle the growing problem of dog theft, trafficking, and consumption,” said Dr. Polak. For more information on the partnership, visit the Khmer Times website.